It’s no secret that deck-building is a favorite game mechanic of mine. Especially when it is done in a unique way. Judging by its cover Concordia could easily be passed as just another “trading in the mediterranean” game. It is not. Mac Gerdts, who is well-known for the rondel mechanism, has managed to combine deck-building, and hand and resource management into a unique streamlined game. He even switched from his trademark rondel to a card version of the rondel. Concordia revolves around its multipurpose action cards which let players acquire resources, move colonists buy new action cards and building houses which all contribute to your end game scoring. All players receive an equal starting hand of action cards at the beginning of the game. Players also receive 2 colonists starting in Rome and use them to colonize the board.1 sea colonist to colonize over water and 1 land colonist to colonize over land. They also receive a small storage board which starts with extra colonists and some resources. Players takes turns choosing and playing any card from their hand of action cards carrying out the corresponding action. The card is then placed in a face-up discard pile. The only way to get the actions cards back into their hand is through the action card Tribune. Other action cards let players move colonists and build houses, buy new action cards, trade resources and produce resources. There is even a Diplomat action card which let you copy the top card in an opponent’s discard pile. That last one allows for some great plays when you time things right. Buying more action cards, and maximizing their conditions on the board is the heart of the game. You buy cards from a line of rising costs, so you can plan to try to get the cards you want. Strategy comes from deciding on which type of scoring to focus on and to keep your opponents from buying the action cards they need to score in the categories they are pursuing. At all times there are 7 new action cards available to buy with players Senator action card. Unlike other deckbuilders bought cards go to your hand. And are already playable in your next turn! There are multiple reasons players want to buy new action cards. One is because the action cards also represent end game points. Every action card has a god listed in the bottom of the card. These gods each have a different scoring type. Card with the Jupiter god symbol gives you points for building houses in multiple cities, Saturnus grants you points for being present with your houses in different provinces, Mercurius is worth points for diversifying the type of goods you produce. Mars gives you points for having colonists on the board, and Minerva gives you points when you specialise in a specific type of resource. You’ll score points points based on your action cards at the end of the game based on the game state on the board. Once all action cards are bought the game ends. And then, only then, players points are tallied. Concordia is full of small but elegant game mechanics. A neat example of this is whenever you get extra colonists from the storage board onto the game board it opens up extra storage space allowing you to store more resources. To be honest Concordia is a dry Euro-game… But it all works so well! It is as streamlined as can be. The rulebook is just 4 pages long for crying out loud! The interaction between managing your cards for their abilities and the scoring they provide creates interesting choices. There is always a meaningful decision to be made on your turn and although players can cross each other, it never becomes cutthroat. Fighting for the action cards to maximize their points and getting to the cities while they are cheap is where most of the interaction between players come from. There are many scoring options, which makes it hard to tell who is winning, especially because all the scoring is at the end of the game, so everyone stays involved to the end. 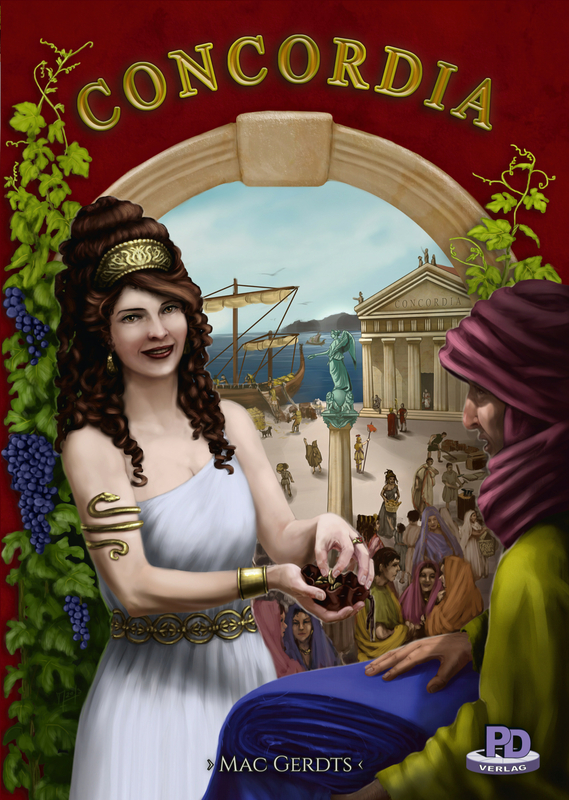 The variety of actions and mechanisms in Concordia work together smoothly to create a very satisfying game experience. I know the fact that the scoring is only at the end might bother some, but for me it increased the tension. Concordia was an overlooked game by me when it came out in 2014. And that’s a shame. A nice thing is PD-Verlag, the publisher, keeps on releasing new maps for the game to keep the game fresh. Concordia is not a difficult game, but there is a lot going on. Players basically choose and play a card and perform the corresponding action. Managing the cards is quite a challenge, but every play a players makes does something to improve their position. It’s also a forgiving game making this accessible for non-gamers too in my opinion. The expansion Salsa adds a wild commodity and extra forum tiles and maps to make Concordia more complex if needed. I'm Peter van der Helm, married, and live in the Netherlands. It started in 1994 when I bought an starter deck from Deciphers Star Trek CCG and have played multiple CCG's and LCG's since. I have a game group in Deventer with whom I play boardgames. I mostly like medium length games with a good theme.